Hip hop artist Robert Diggs, better known by his stage name RZA, grew up watching Chinese-language kung fu classics while living on Staten Island in New York City with the other members of his group, the Wu-Tang Clan. “The Man with the Iron Fists,” which RZA directed, co-wrote, and stars in, sees the rapper/producer fashioning a love letter to the films that so heavily influenced him. Unfortunately, his generally good intentions fall largely by the wayside due to shallow characterization, increasingly unlikely magic and seven seas of crimson gore. The movie’s plot revolves around a small Chinese village packed to the gills with intrigue and violence. At the center of everything sits the blacksmith shop of Thaddeus Smith, aka The Blacksmith, played by RZA himself. The Blacksmith forges weapons for anyone who has the money, and he comes to know almost all the secrets in town. The other hot spot is the Pink Blossom brothel, run by Madam Blossom, played by Taiwanese American actress Lucy Liu. Her high-class hookers, bolstered with fine food and exotic liquors, attract visitors from far and wide. Madam Blossom keeps a close eye on her customers. She, too, knows most of the things others attempt to hide. The rest of the plot concerns a large shipment of gold and the various clans trying to get their hands on it. 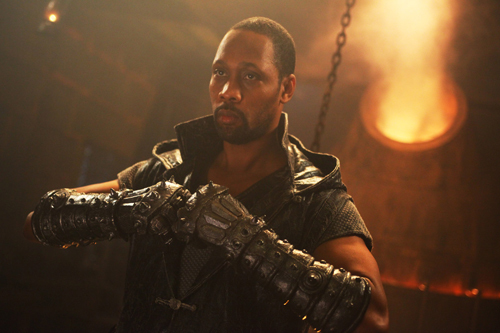 RZA and his co-writer, Eli Roth, sacrifice depth for flashiness along the way. Characters appear, strut their stuff, and a huge fight breaks out with regularity every 10 minutes or so. However, we never get a strong, sophisticated sense of where these people come from, only broad outlines of betrayal and revenge. Lucy Liu, as Madam Blossom, strikes sophisticated poses and shows off her shining eyes, but she isn’t given much to express through her eyes or her poses. She walks through the film aloof, the sad embodiment of the “dragon lady” stereotype that’s plagued many Western interpretations of Chinese culture. Chinese American actor Daniel Wu has one of the most colorful roles as Poison Dagger, master of remote assassinations. Poison Dagger walks with a hood over his head for much of the film, and his sinister, wavering voice sounds uncannily like that of the late David Carradine. Carradine, product of a prominent American acting family, was not Asian, but played the lead in the well-known “Kung Fu” television series from 1972 to 1975 and helped popularize Asian martial arts in the West. I get the feeling that if Carradine was alive, the part would have gone to him. One problem with RZA and Roth’s plot is that there seems to be no limit to the character’s powers. If one character wins an early round using strong magic, their opponent simply strikes back using stronger magic. The many fight scenes come off kinetic, but their implausibility, combined with blenderized editing makes it impossible to follow any fight. Another problem is the blood. The movie has plenty of it. It spills out of orifices, out of necks, out of the stumps of severed limbs, so fast and so thick that it overwhelms any subtlety. This looks more like Roth’s work than RZA’s — after all, Roth and his contemporaries earned the collective title “The Splat Pack” — but it turns offensive and tedious quite quickly. “The Man with the Iron Fists” is currently playing at several theatres throughout the city. Check local listings for theaters, prices, and showtimes.